The Volsung Kindred is a group of individuals dedicated to re-introducing the ancient beliefs and traditions of the Norse people. The purpose of our Kindred is to spread knowledge of our ancestors and re-awaken our old faith, the worship of the Aesir & Vanir. Our Kindred has absolutely no political agenda, are 100% racist-free, and we do not seek to actively convert people who already are comfortable with their present faith. At present we have seven active members and always encourage new members to contact us! 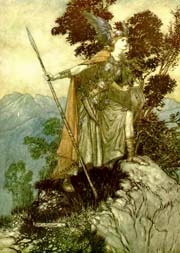 Have a couple of questions about Asatru? Check out our page!! Drop Us A Line Sometime! !